You need to feel it more. You're welcome! Characters looking good as always, I'm jealous, haha. What did you do to get that backround on yourcomputer? Thanks for the rep, glad someone agrees. oh my gosh, your from vancouverrrrr in canada eh? I am from melbournnnnneeeee australia mate. and my accent is semi australianskii. how ya going karen?? ?just muckin around with ya. Haha awesome, Australian accents are cool. yeah, doing okay...how about we follow one another on the forums we can chat more. ;)how are you going? Oh man, one of my former high school teachers is being reprimanded for duct-taping a student's mouth shut. Can't believe that made the news. Yeah, they usually deserve it. This wasn't the first time she's done it, but some PTA member found out and made a big deal of it. So apparently duct tape truly does solve everyone's problems. My god, unarmed killcams are epic. I literally lifted a bandit up by the crotch and smashed his face into the ground. Panthera, mamali and Anouck like this. I even have an album about bacon on these forums..
Hello there. I came here to steal your bacon. I'm sorry, we can't be friends anymore. Spent about 15 minutes explaining and demonstrating the concept of 'copy and paste' to my dad. For possibly the 20th time this year. Medea, AS88 and Mighty Pecan Pie like this. Haha, worst part is he still can't do it. We're pressing the same keys, but somehow he's convinced the function only works in my presence. Congratulations you have now entered existence as a lucky totem. My mum uses me for the same purpose when she buys things online. Lol yeah, I've been that for a while. D: He makes me watch him do everything on the computer, which is excruciating since he's also a two-finger typist. The Honorable Gidian Diva of Sass likes this. Ah, I never had that. I was always a witch by default, very unoriginal. :P Then Supergirl one year, and Totoro last year. It helps of your mother and grandma are masters with artsy craftsy stuff. Dammit, summer, you just came out of nowhere. It's hot as hell all of a sudden. Good, good, 10C is perfect, haha. My aging seems to offend my brother. Aging? As in "lack of"? I told him I'm 18, and he was like "NO, you're not!" HAHA! Your getting old! AND THERE'S NOTHING YOU CAN DO ABOUT IT! Try THAT on for size! My 8 lbs. dog is taking up 3/4 of my chair. This is very uncomfortable. Welp, at least she finally moved off my chair and onto the one I put beside mine for her. Progress. Haha yay for progress! Small victories! 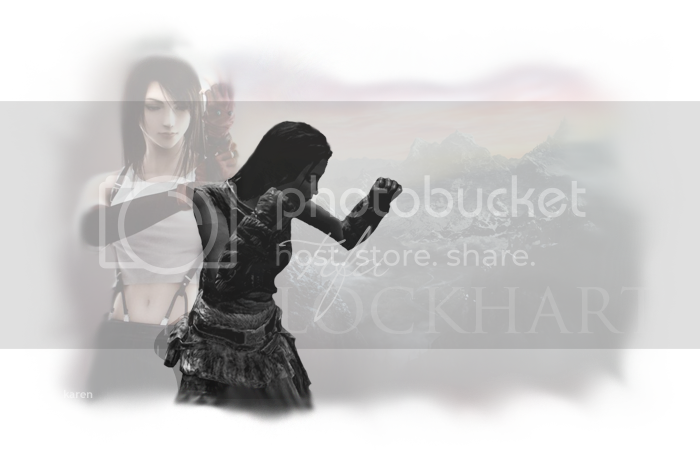 Past sig images I've made and used on these forums. Or am planning to use. Or just wanted to make. Starting to get the hang of fumbling for the screenie key while playing.